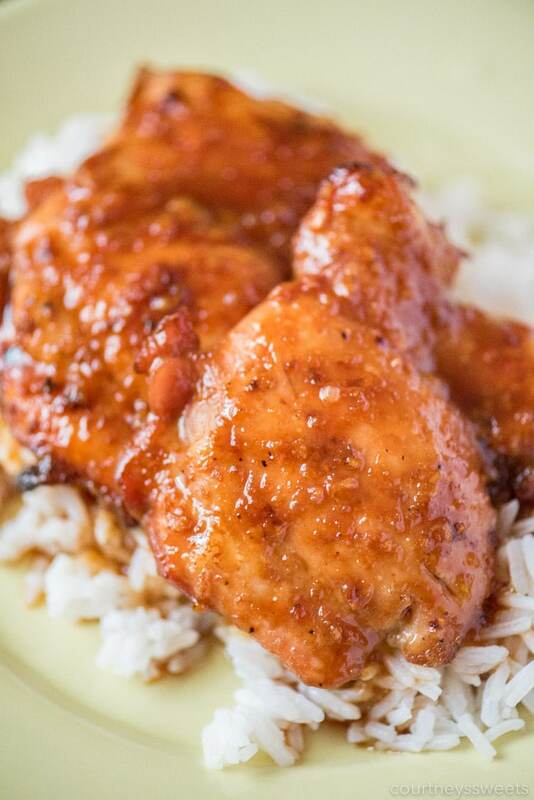 You’re going to love this honey garlic chicken thighs recipe. 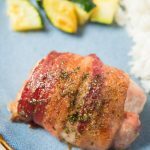 You can use chicken thighs or even chicken breast with this recipe. It’s so good and your family will be begging for seconds. Leftovers are even delicious. There is enough honey garlic sauce recipe for spooning over rice too! 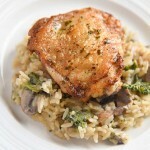 If you like sweet chicken thigh recipes you’ll love our baked boneless chicken thighs. 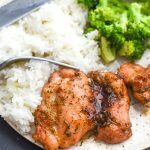 They’re a brown sugar chicken recipe that is a MUST try! 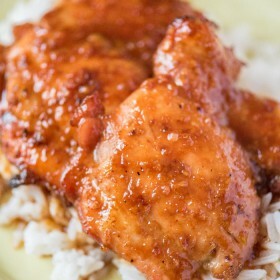 What ingredients do you need to make Honey Garlic Chicken Thighs? 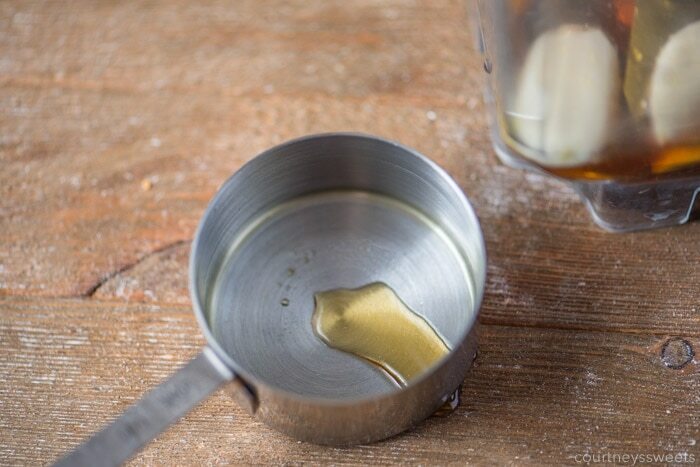 tip: spray the measuring cup with a little olive oil to prevent the honey from sticking to the cup. Start off by placing the honey, coconut aminos, garlic cloves, ginger, and pepper into the blender and blend until the garlic is finely chopped. Once the sauce is ready you can cook on the stove top in a saucepan until the garlic is cooked. Today we’ll be using it in this chicken thigh recipe below. 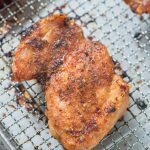 Place chicken thighs onto a parchment lined baking sheet. 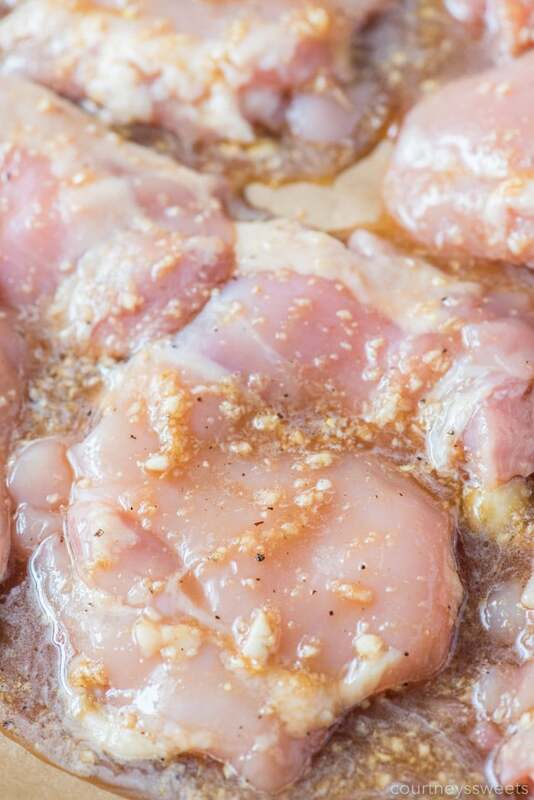 Pour the honey garlic sauce over the chicken and make sure all of the chicken is covered in sauce. You want the flavor all over the chicken. 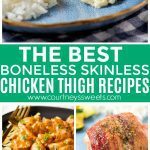 Place the chicken thighs into the oven and cook for 35-40 minutes at 400 degrees F or until the thickest part of the chicken reaches 165 degrees F.
How to serve honey garlic chicken thighs? 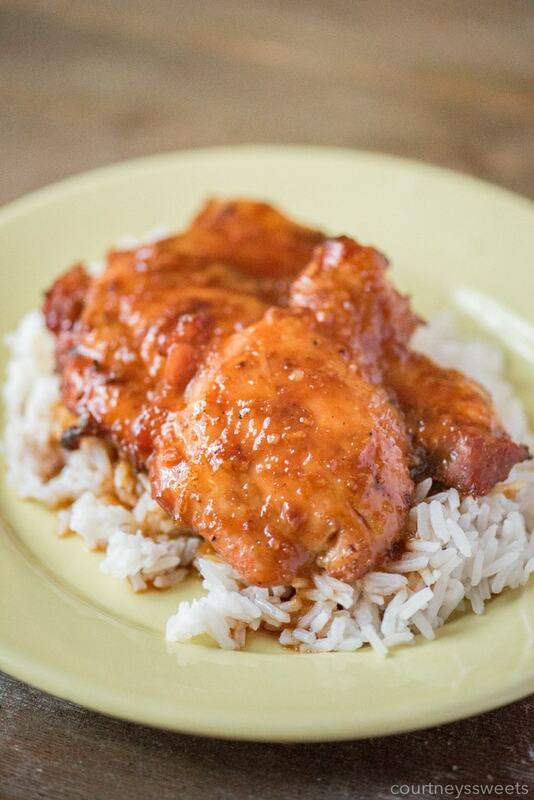 We like to serve baked honey garlic chicken thighs over rice. Spoon some of the extra sauce from the pan right over the chicken and rice. 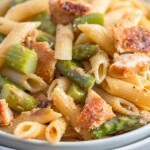 Serve along with your favorite green veggie. 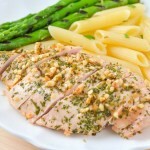 To add more color to this dish you can add some chopped parsley, but we like to enjoy it without the herb flavor. 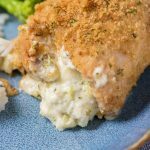 It’s such a simple chicken recipe and so delicious! Other ways to enjoy this honey garlic chicken is making it into Chinese style fried chicken by making a tempura batter and frying the chicken and then cooking in the sauce! Place the honey, coconut aminos, garlic cloves, ginger, and pepper in a blender and blend until garlic is finely chopped. Alternatively, you can mix the ingredients together and mince the garlic. 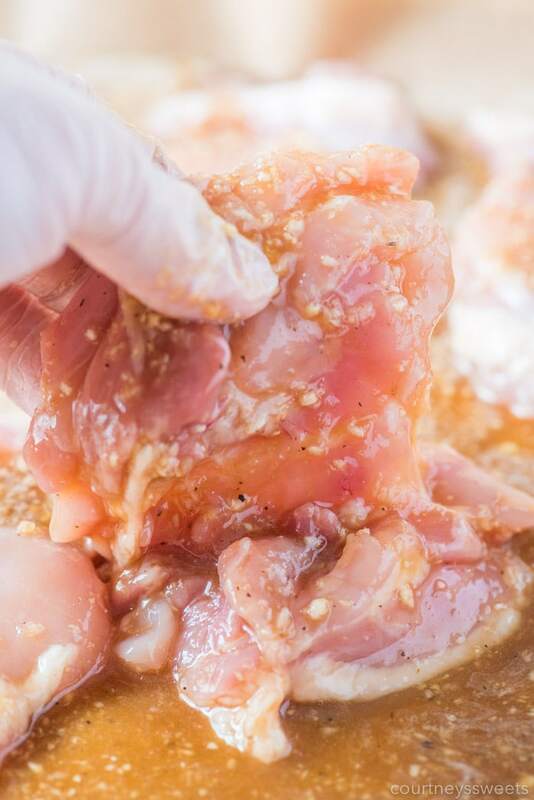 Once the sauce is ready pour it onto the chicken. 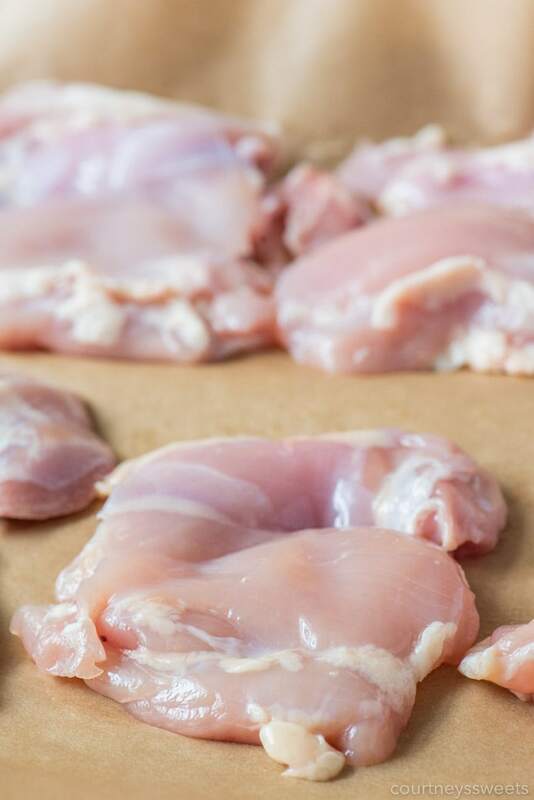 Always cook your chicken until the internal temperature (thickest part) reaches 165 degrees F.
This can also be made in the slow cooker, just put all the ingredients into the slow cooker instead of a sheet pan. Cook on high for 3-4 hours or low 5-6 hours.